Creating defensible space around your home is not enough. Reducing structural flammability is just as important and the two need to go hand in hand in order to reduce your wildfire risk. "Local, state, and federal fire agencies are urged to expand their fire education efforts. Currently, the primary, and sometimes the only message citizens hear is to clear native vegetation (“brush”) from around their homes. While creating defensible space is a critical component of fire risk reduction, it fails to address the main reason homes burn – embers landing on flammable materials in, on, or around the home, igniting the most dangerous concentration of fuel available, the house itself. Fire risk reduction education must emphasize BOTH how to reduce home flammability and how to create defensible space. As seen in the photo below, many homeowners have complied with defensible space regulations only to see their homes burn in a wildfire. - removal of flammable materials near the home such as wood stacks, trash cans, wooden fences, etc." Above: "The New Message. 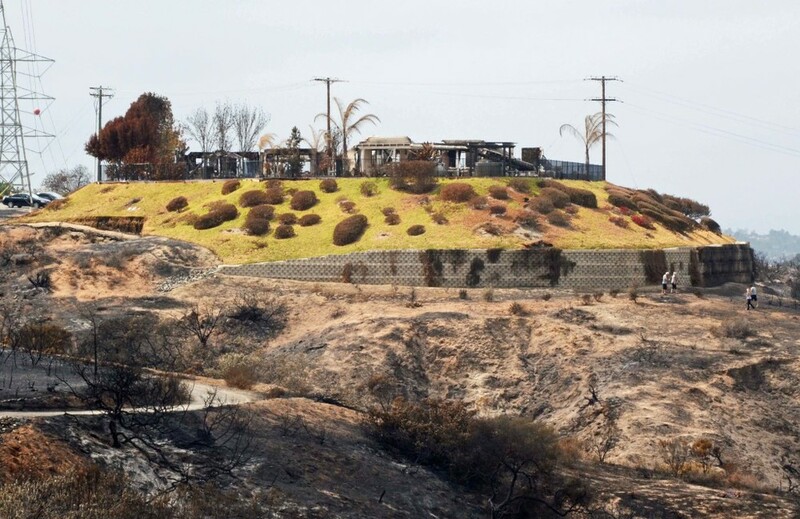 The photo above shows two homes with extensive defensible space and proper vegetation management that burned during the May 14, 2014, Poinsettia Fire in Carlsbad, California. Addressing the entire fire risk reduction equation is essential."